When the Second World War ended, Don Bradman assembled a cricketing army. Hailed as one of the greatest cricket teams of all time, the 1948 ‘Invincibles’ are the only Australians to complete an Ashes tour undefeated. Their crushing victories under Sir Donald Bradman’s captaincy created history, even if the Don himself, on his final tour, was left stranded for ever with a Test batting average of 99.94 after his duck in the fifth Test. Yet the mixed feelings about the manner in which these feats were achieved are often forgotten. In his fascinating account of the legendary tour, Malcolm Knox exposes the rift between those players with experience of the horrors of active duty, epitomised by the fiery but sporting RAAF pilot Keith Miller, and those without, such as the invalid Bradman. Knox reveals unease among the fans, commentators and players – from both teams – about Bradman’s resolute tactics, both on the field and in the pavilion. Bradman’s ruthlessness, even against war-ravaged veterans at the county clubs, dashed hopes that the legacy of Bodyline would finally be laid to rest and the postwar game resume in a more congenial spirit. 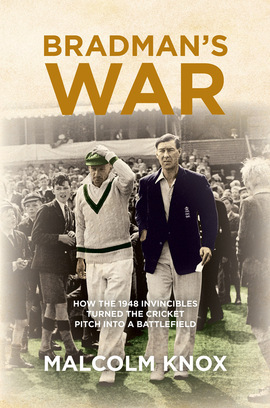 While Bradman’s War celebrates the talents of the likes of Ray Lindwall, Sid Barnes, Lindsay Hassett, Bill Johnston, Arthur Morris and, of course, their incomparable captain, it also questions our appreciation of sporting entertainment when rivalries escalate – and competition verges on hostility. If the spoils are to the victor, what is there for lovers of the game? [Bradman's War] is well worth a look. All brilliantly recollected by Malcolm Knox. The last word on a seminal chapter in sporting history.